Free Download: David Irving, "Churchill's War, vol. ii"
The three Parts of this book comprising about a dozen chapters each are PDF files; the endnotes and appendices are also a PDF file. Each file is about 1MB. Get the Acrobat Reader 4.0 free below too, if you don't have it already. ...download these tools-----------------------... Can't read PDFs? Get Acrobat Reader free!... Get StuffIt Expander for Windows free!... Get StuffIt Expander for Macintosh free! 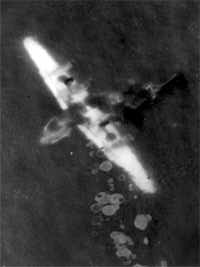 In Chapter 34: 'Soldiers must Die...' General Sikorski's plane lying on the Mediterranean seabed, July 5, 1943 (author's private collection). You can read and print PDF files on Mac, PC, or any platform. Each file takes about seven minutes to download. In order to view these files properly, we encourage you to upgrade to Acrobat Reader 4.0 at no cost to you. Your server may not permit large file-downloads.